I love it! It’s actually bigger than I expected. It’s 4 inches on each side. You can adjust the little bars on the left side of the jewelry box. The pale pink is such a pretty color. It does have a strong chemical odor, but I think it will go away in time. My boyfriend commented and said that it’s a really good price for the size and how nice it is. If you are thinking about getting it, you should! 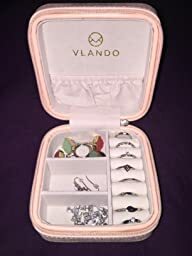 Very pretty little jewellery box, perfect for taking on a trip away to keep items safe and in one place. It’s 4 x 4 x 2.5 inches so easy to slip into your suitcase or bag. That gives plenty of space for earrings, rings or chain style necklaces and bracelets. Its in a faux leather effect with a soft padded top and a secure zip to stop items falling out. 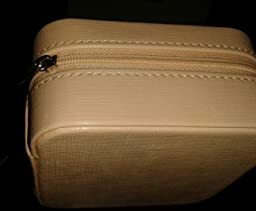 Inside its a soft creamy beige velvet effect with dividers to stop chains tangling and a handy little pouch in the lid. Compact but very useful and well thought out design. I’ve the one in pale pink and its really attractive. It comes in a grey card display box it a perfect gift. If you enjoyed my review I’d love it if you would please click “Like” and if you didn’t I’d love to know why so I can improve the usefulness of future reviews. 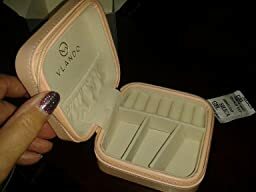 I got this to hold my small daily wear jewelry by the bedside so I can secure them and access them quickly vs my large jewelry armoire. I was worried this might be too small but it’s perfect! 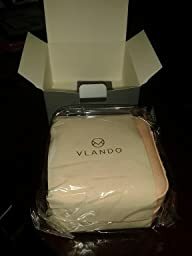 Came well packaged and holds a good deal of jewelry. Bear in mind I do prefer tiny understated jewelry so this was perfect for me. I used the ring rolls to hold some studs in place as well and the pocket on top was perfect for holding small bangle bracelets.